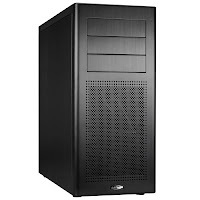 30 August 2011, Keelung, Taiwan – Lancool, a manufacturer of mid- to high-end computer chassis, has launched a new mid-tower PC case – the PC-K9 Series designed for ATX, Micro-ATX and Mini-ITX motherboards. Manufactured with easy hardware installation in mind, the case cradles components in a reduced-vibration housing with top-rate thermal performance capabilities. The Lancool PC-K9 makes a lasting impression with its a striking black or silver brushed aluminum exterior, and SEC steel interior – a true compliment to any computing environment, including gaming. - Tool-less PCI card holder that holds up to seven PCI add-on cards; installation involves simply locking the arm into position. - Tool-less PCI card clips are made of steel, guaranteeing a reliable grip and saving the parts from wear and tear. - Tool-less optical drive mounting that supports standard 5.25” optical drives. - Tool-less PSU holder that allows users to insert the PSU into position, and then just close the aluminum PSU holder. The chassis' modular HDD cage supports six 3.5-inch HDDs (three 3.5" HDD cages in two separate modules) and four 2.5-inch HDDs, using thumb screws with rubber suspension. Users can also choose to have their HDDs face forwards or backwards. The top cage module can be removed, allowing a full 415mm interior space for those who prefer longer VGA cards. The Lancool PC-K9 is equipped with two USB 3.0 connectors for 20-pin connectors, to meet up the latest standard of motherboards. Two fans (140 mm in the front, and 120mm in the back) prevent user components from overheating. The upper fans and air vents below the PSU include washable air filters to keep the inside of the case clean. Lancool recognizes the importance of good cable management and is the first to introduce a unique set of clips along the back of the case that keeps cables neat and easy to manage. In additions it features holes for easy use of cable ties at critical locations. There are 3 versions available for the PC-K9 black color series – standard steel color called PC-K9A; all black interior called PC-K9X; and black interior with a window side panel called PX-K9XW.